Are you more sophisticated than a salamander? Are salamanders more complex than humans? Well, it depends on what you mean by “complex”—but for the sake of this article, let’s say we are the more complex ones (granted, salamanders can regenerate limbs, which is a pretty neat ability). This might seem obvious, but you might be surprised to learn that a salamander known as the axolotl (Ambystoma mexicanum) has a haploid genome that is 10 times larger than humans (32 billion1 vs. 3.2 billion base pairs)! So, what does having a larger genome really mean for an organism? What impact genome size has on an organism has been a topic of ongoing study in the world of evolutionary biology for decades2. The assumption that humans are more sophisticated organisms and must have a larger genome has been around since we first learned that DNA carries the instructions for how to build life. But this assumption isn’t necessarily true. Take the mouse, for example. Mice are significantly smaller than humans and, by some measures, are considered to be less sophisticated organisms. Naturally, you may think that the human genome would also be larger and carry more genes than that of a mouse’s, but you’d be wrong. It turns out that the mouse (Mus musculus) genome codes for roughly the same number of genes that the human genome does. In terms of numbers, the human genome has about 3.2 billion bases and codes for nearly 20,000 to 25,000 genes3. In comparison, the mouse genome also codes for this many genes, but with only about 2.5 billion bases! Only a small fraction of these genes are different between humans and mice, but that small fraction obviously makes quite a difference. What does having a larger genome really mean for an organism? But at least humans and mice are both mammals and are more closely related than humans and other vertebrates, like fish. Surely we have a larger genome than fish, right? Not necessarily! The largest reported genome size in vertebrates is not in humans, but in a type of fish: the marbled lungfish (Protopterus aethiopicus), which has roughly 130 billion bases. Research on plants, fungi, insects, and animals has taught us that the size of an organism’s genome is not necessarily indicative of the type of information contained therein3. To understand this, it helps to think of your DNA, and your genome, as being equivalent to a cookbook. The total number of pages in the cookbook might give you an idea of how many recipes it contains, but that estimate might be less accurate if some cookbooks contain pages that aren’t strictly recipes—like food illustrations, advertisements, and blank pages. The important information is contained within the recipes, and extra pages between sections don’t impact the recipes themselves. Additionally, lots of cookbooks include the same or very similar recipes, in addition to completely different ones. If you lined up a stack of cookbooks with the spines and covers facing away from you, it would be very difficult to choose one to plan your dinner based on the number of pages alone. Basically, adding DNA to a genome doesn’t necessarily equate to adding more function to it. So, returning back to the fascinating axolotl: Does its 32-billion-base-pair genome explain all of the differences between humans and salamanders? The answer is no, but that’s not to say there aren’t interesting features embedded within its genome1. Scientists have been interested in studying this creature since the 1800s due to its ability to regenerate limbs. As a part of this effort, the axolotl genome was recently sequenced1, making it the largest genome to ever be sequenced (so far). 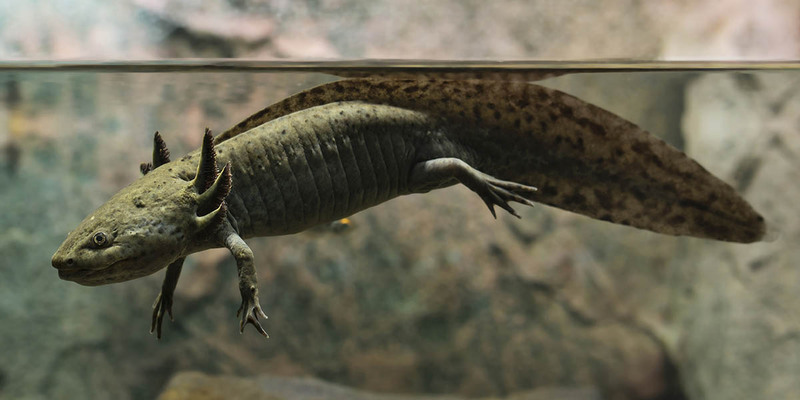 Among other discoveries, the researchers found that the large genome of this salamander was due to long stretches of duplicated DNA and about 23,000 different protein coding genes which is surprisingly close to the number of genes in humans. Sequencing the genome also allowed them to speculate (with some evidence) that limb regrowth is due to salamander-specific genes related to development, and the sequenced genome now provides a reference for future experiments in this area. Still, there may be ways in which the size of an organism’s genome does affect its traits2. This is a hotly discussed topic with many suggested theories for how genome size relates to the overall organism and its evolution. At the very least, we know that the relationship between the size of an organism’s genome and its physical features is not straightforward, and a large genome does not necessarily mean an organism will be correspondingly larger or more complex. 1Nowoshilow, Sergej, et al. “The axolotl genome and the evolution of key tissue formation regulators.” Nature, vol. 554, no. 7690, 2018, pp. 50–55., doi:10.1038/nature25458. 2Bernardi, Giorgio. “The Neoselectionist Theory of Genome Evolution.” Proceedings of the National Academy of Sciences of the United States of America 104.20 (2007): 8385–8390. PMC. Web. 7 Feb. 2018. 3Pertea, Mihaela, and Steven L Salzberg. “Between a Chicken and a Grape: Estimating the Number of Human Genes.” Genome Biology 11.5 (2010): 206. PMC. Web. 7 Feb. 2018.